English author, comedian, filmmaker, broadcaster and radio presenter. 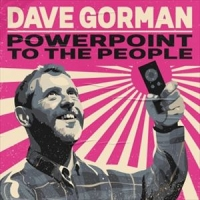 His works have included "Reasons to be Cheerful", "Are You Dave Gorman? ", "Dave Gorman's Googlewhack Adventure" and "Genius". Gorman starred in the BBC Three TV series Rob Brydon's Annually Retentive. Tours include: "Sit Down, Pedal, Pedal, Stop and Stand Up", "Dave Gorman's Power Point Presentation", "Gets Straight to the Point (The Powerpoint)" and "With Great PowerPoint Comes Great ResponsibilityPoint".